As I mentioned earlier, I spent the week after Thanksgiving in Disney and it brought back several memories from my childhood, when I last visited the Magic Kingdom. some of the rides and attractions from then are gone, some (perhaps) should be, and many new things have been added. As I walked around with my family, nearly 30 years after my own visit, it was amazing how many things I remembered about the park. I remember the Big Thunder Mountain Railroad, a roller coaster for the entire family, and I smiled as both of my children wanted to ride it over and over again as I had. I was also happy they were brave enough to get on the ride, since our first ride at Disney was a terrifying free fall ride at Disney’s Hollywood park. I’ll talk about that another time. My daughter did not want to go on the other coasters, but my son and I took some time together to ride the more adventurous rides. First up was Space Mountain. Disney is not known for roller coasters, and Space Mountain is very old by the standards of most parks. However, I was not able to ride it when I went to the park, so I was excited to finally get the chance. My son and I rode it 10 times in all. There are no big hills, but the darkness, fast spins, and unique setting made it fun. Next, we rode Expedition Everest at Animal Kingdom. Aside from the bus station being located next to what must have been the animal toilet, this park was very nice and we enjoyed it. The Everest ride, like all Disney rides, was heavy on theme but we did not know what to expect from the ride. Again, no huge hills on this one, but it featured an exciting backward portion of the ride, a small to medium hill, some fast turns, and a Yeti. Andrew, my son, and I rode this one 8 times. I think it was his favorite. Finally, we returned to Disney Hollywood and rode the Aerosmith roller coaster. This one was also heavy on theme, but it was nice to hear some good old rock and roll while standing in line. We did use our fast pass options until they ran out and we waited over an hour to ride it once. This one did not have any large hills, but did feature some loops, which are exciting. The most exciting/intense aspect of this coaster is the speed. The premise is that we are in a limo in a rush to get to an Aerosmith show. Once loaded into our seats, we wait until the traffic light changes and then we rocket forward from 0 to 60mph in 2.8 seconds (according to the brochures). ZOOM ZOOM! The ride is very brief, but enjoyable, and I hope we will put it on heavy rotation when we go back in a year or two. I love old Aerosmith music, but I hope they skip over some of the later power ballads in the future. Oh well, at least it was rock and roll and not a rick roll (don’t ask about that annoying phenom, just click here if you are brave enough). Oddly, the place I remember the least was the hotel where I stayed as a child. 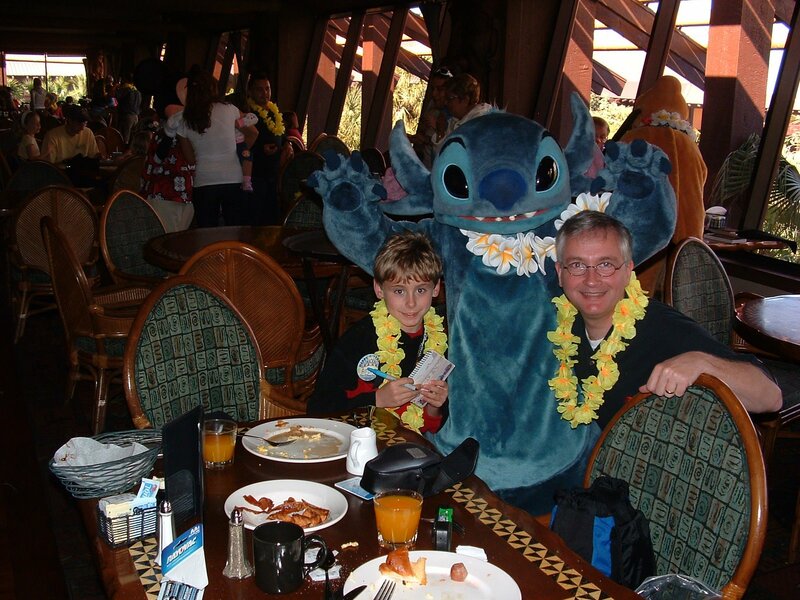 Although we stayed in one of the newer resorts, Andrew and I had breakfast at the Polynesian Village, where I had stayed. There we ate some of the best food we had on the trip and had our pictures made with some of the Disney characters. All in all, it was a good trip and a much appreciated break from the bizarre year I’ve had this year in my career. We might not have planned the trip when we did if not for a chance invitation to a reunion website from my old high school. There, I ran across the younger sister of a friend from school who works as a Disney only travel agent. She planned the whole thing. If you are thinking of going, email me. She took care of all of the plans for us. I’m already thinking about a Disney cruise although is it really Disney without a monorail?